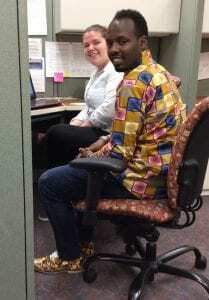 A refugee resettlement intern helps a client work on his resume. If you’re a college student who would like to complete your internship or practicum at our agency, we have a variety of opportunities each semester. We encourage you to apply at least one semester in advance, as some of our internships fill up quickly. Our internships are unpaid, but we provide work experience opportunities that you cannot get in a classroom. The first step in the application process is to complete our online application form. CLICK HERE to get started! All of our interns and volunteers must attend a general agency orientation session before they can get to work. If you’re applying for an internship, you can wait to find out if you’ve been selected, or you can get a head start by attending a session right away. The sessions are one hour long, and will give you an overview of our agency and our policies. 2nd & 4th Tuesday of each month • 6:00-7:00 p.m.
1st Wednesday of each month • 2:00-3:00 p.m.
3rd Thursday of each month • 9:30-10:30 a.m.
RSVPs are requested, but not required. If you are interested in interning/volunteering with our Refugee Resettlement program, please bring your driver’s license and a copy of your auto insurance to orientation. Opportunities: Several students per semester can intern in our Choice Food Pantry (either long-term internships or short-term practicums) and/or in the FSS program (long-term internships). Requirements: Students must be working toward an Associates or Bachelors degree, preferably in social work, culinary arts, hospitality management or related field; must be able to work with diverse populations and treat all with dignity and respect; need to have the ability to network with other persons or agencies to meet client needs/goals. Time Commitment: Hours are Monday-Friday; pantry is open in the morning; FSS generally sees clients in the afternoon. Opportunities: Several students per semester can intern in Erma’s House (either long-term internships or short-term practicums). Students are generally working toward an Associate, Bachelors or Masters Degree in social work, psychology, criminal justice or a related field. Must be able to work with diverse populations and treat all with dignity and respect; prefer knowledge of parent-child interaction, family dynamics, divorce and child custody issues, and negotiation skills. Supervision: Staff member with BSW and LSW. Time Commitment: According to school schedule to meet requirements of internship/practicum. Opportunities: One student per semester can intern in the Dayton counseling center (long-term internship). Student must be working toward a Masters degree in Social Work; must be able to work with diverse populations and treat all with dignity and respect; able to utilize appropriate supervision and peer consultation, familiarity with and interest in goal-oriented counseling, able to formulate and carry out independent assessment, diagnosis and treatment plans; sound interviewing, intervention and documentation skills. Opportunities: Several students per semester can intern in the ParentLink program (either long-term internships or short-term practicums). Students are generally working toward a Bachelors or Masters degree in social work, psychology, criminal justice or related field; must be able to work with diverse populations and treat all with dignity and respect; prefer knowledge of adolescent services, youth development, and/or child welfare. Opportunities: Several students per semester can intern in the Refugee Resettlement program (long-term internships). Students are generally working toward a Bachelors or Masters degree in social work, international relations, or related field; must be able to work with diverse populations and treat all with dignity and respect, with special emphasis on limited English speaking refugees. All refugee resettlement interns must be willing and able to transport clients. Time Commitment: Minimum of 15 hrs/wk (2 full days) for a period of at least 12 weeks (3 months). Must be available to work full days during the week, Monday–Friday, between 8:30am–5:00pm; this program does not offer evening and weekend hours. Opportunities: One to two students per semester can intern in Human Resources (long-term internships). Students must be working toward a Bachelors or Masters degree in Human Resources, Management, or a related field; must be able to work with diverse populations and treat all with dignity and respect; able to use computer with substantial ease (Microsoft office), able to support and problem solve with staff and volunteers, excellent oral and written communication skills, ability to maintain professional ethics and confidentiality. Opportunities: Not more than one intern per semester assists the Communications Manager with projects and tasks such as planning, shooting and editing video; creating promotional materials for agency programs/events; photographing agency activities/events; researching best practices; preparing graphic/visual content for social media posts; and maintaining agency brand standards. Must have own laptop or tablet computer with legally-obtained graphic design and/or video editing software, and not require guidance in the basic use of these tools. Junior or senior-level status at an area college or university preferred, with a major in Communications, Marketing, Graphic Design, Visual Communications, or a related field. Time Commitment: Must be able to work 8-10 hours/week, for at least one semester. If the intern’s school requires a higher number of hours to fulfill internship credit requirements, CSSMV can work with the intern to meet those requirements. Opportunities: Not more than one intern per semester assists the Communications Manager and other members of the Marketing & Development Department in the creation of promotional materials for various agency programs/events; the planning and execution of special events; the planning and implementation of public and media relations activities; etc. Students should be Junior or Senior-level status at an area college or university, preferably in Communications or Marketing; fluent in Office software (Word/Excel/Outlook); solid written and verbal communication skills; professional demeanor/appearance; ability to work independently with minimal supervision; ability to maintain professional ethics and confidentiality. Opportunities: One to two students per semester can intern in counseling (long-term internships). Students must be working toward a Masters degree in Social Work or Counseling; must be able to work with diverse populations and treat all with dignity and respect; able to utilize appropriate supervision and peer consultation, familiarity with and interest in goal-oriented counseling, able to formulate and carry out independent assessment, diagnosis and treatment plans; sound interviewing, intervention and documentation skills. Must be able to obtain a certificate to practice from the Social Work Board.